Rooftop botany goes to ground - my plant nursery: The Cape of No Hope! 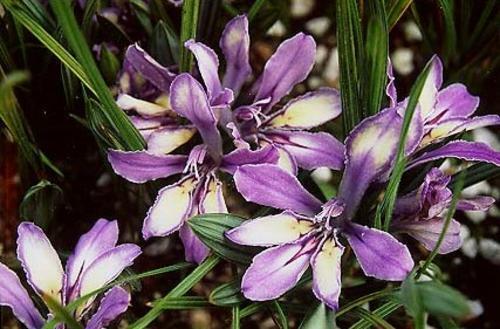 Plodding around the Web trying to find some rare Iris or Lily seeds to get me going when spring and its cotyledons come around, I stumbled upon a South African site called BidorBuy, a kind of eBay for seeds. My success with Irises, Lilies and Gladioli has given me some much-needed confidence when it comes to bulbs from seed (I'm convinced 90% of what makes "green fingers" is confidence, the other 10% being knowledge and an innate feel for the plants). It wasn't the easiest of sites to navigate but I found myself buying packets of 10-30 seeds of eight species I am completely unfamiliar with. I just went for the ones I liked the look of; did no research; and so am totally in the dark on how to treat them but with the Rand being quite weak I spent less than £20 so if even one or two of them come good it will have been worth it. Actually, I have heard of some of them, the genera anyway. This is Dierama dracomontanum, another Iridaceae , from the Drakensburg mountains. "From seed these can take seven years to flower," says one site, adding that the Dieramas tend to come from moist, mountainous grassland. Seven years is a long time but if I keep sowing and planting, each year will provide something new, so I'm not fussed. Honest. 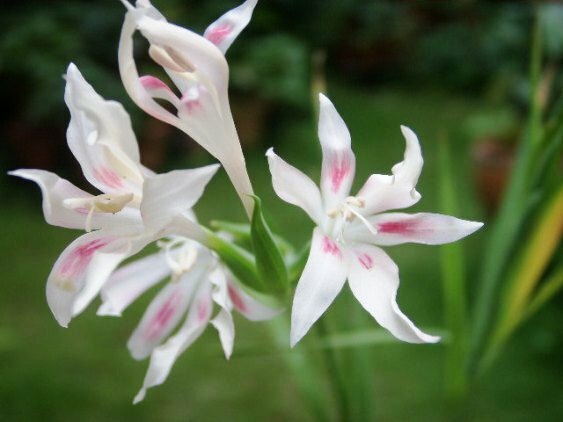 Dipcadi serotinum was chosen by me for its vaguely Lily-like looks but is in fact a member of the Hyacinth family. It likes a sunny spot and hates cold in summer (well, it's gonna have to get used to it!). The tubers appear to have a period of dormancy over winter when they should be totally dry, with watering gradually reintroduced in early spring (just like those pesky Oncocyclus and juno Irises I'm growing). Gelssorhiza tulbaghensis, crikey what a mouthful! This is in the Iridacaea, hence the slight appearance of a fully open crocus. 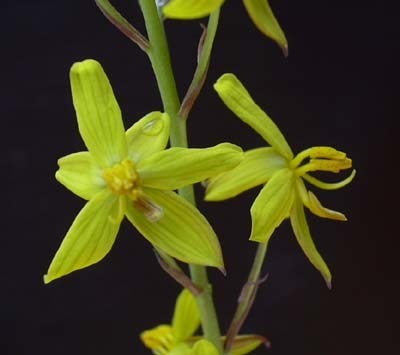 It's found on clay flats and banks in the north and southwest Cape, in fact the whole genus lives in winter rainfall regions and benefit from copious watering during growth in a pot. Another genus I'm familiar with, having 100 inch-high seedling of G. tristis in a covered tray outside on the roof that all came up one night, as if reacting to a command from Mother Nature. This is a late spring/early summer plant of marshy sandstone in the southwest and northwest Cape. 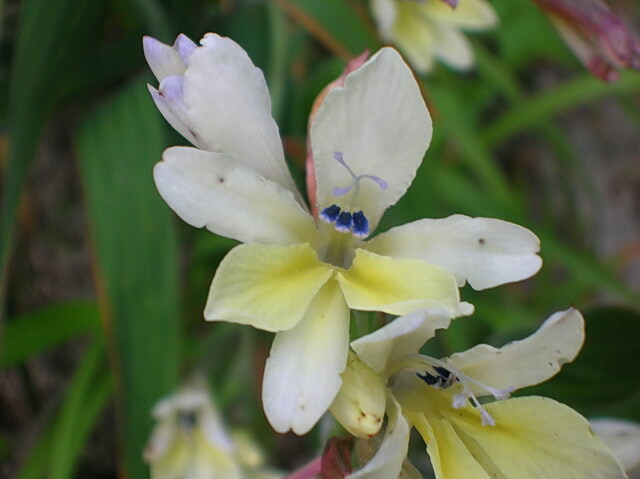 According to the Pacific Bulb Society, given the right conditions this plant can naturalise outside of South Africa. But before I get too excited they mean places like California and Western Australia, not London, E2! G. tristis. There are dozens more now! 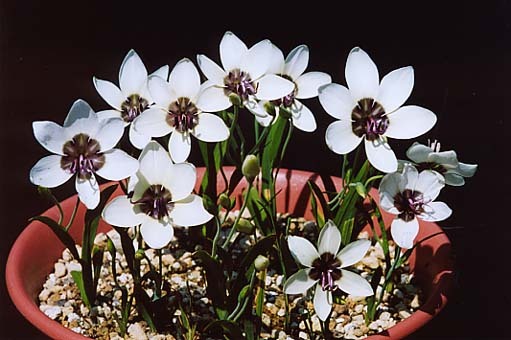 And lastly, Zephyranthes robusta, or the Rain Lily. It's also encouragingly featured on a site called easytogrowbulbs.com! Now that I've plugged them, I hope they don't mind me quoting them:"This plant has earned its name by blooming for a long season, beginning in June and continuing on and off through September ... This is a plant that asks for little, delivers dependably and should grace every warm weather garden.". It's hardy to zones 7-10 so might need lifting over winter. Or just chuck it in the greenhouse. I have also taken a shine to a Clematis flowering in the schoolyard next door. By dangling myself and my broken foot over the wall I was just able to grab a handful of fluffy seedhead. It's a blue/purple macropetala looking thing so quite what its progeny, if it comes up, will look like is interesting and exciting to think about (I'm so sad!). Also sown, in the hope that they will stay put until spring, were Cyclamen pseudibericum, Clematis ladakhiana, Penstemon digitalis and Iris graminea (again). C. Ladakhiana. Not a thing of conventional beauty but I like it! A few of the Frits are beginning to show signs of growth, as is Iris svetlanae so a tentative drink has been taken but I've got to remember that it's only November.